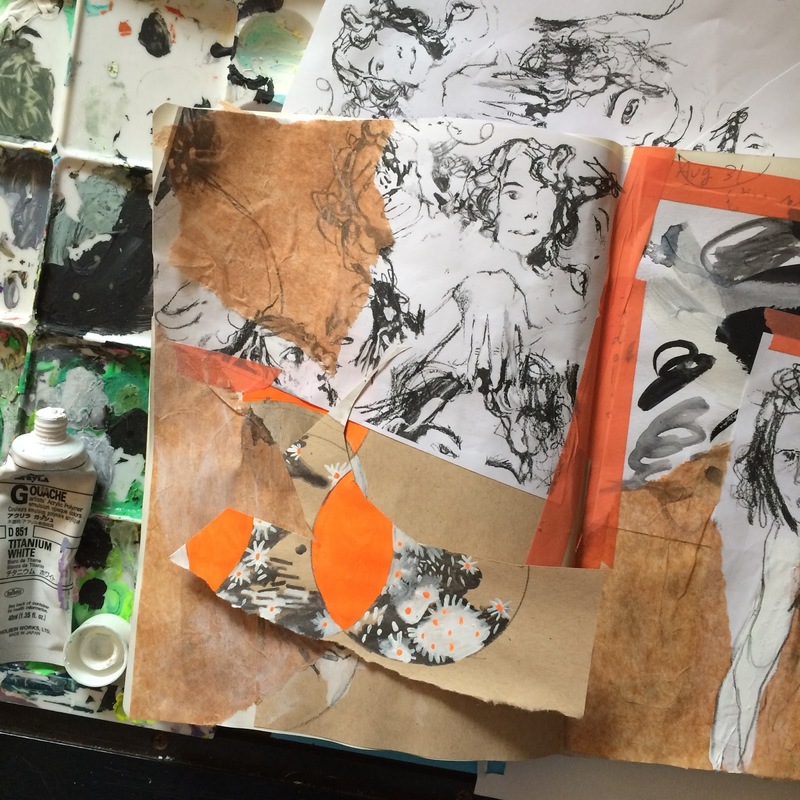 A major aspect of Cait Sherwood's artistic process is her daily practice of working in her art journals. 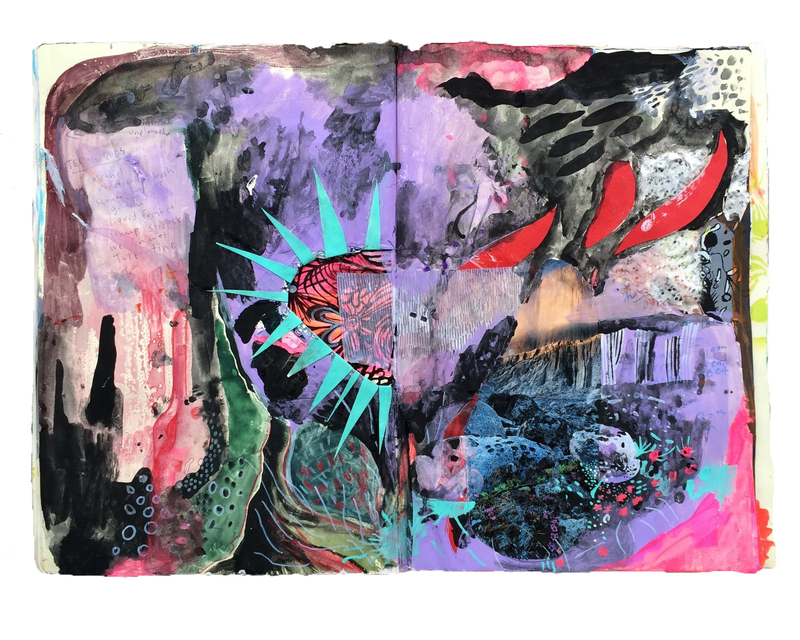 She fills those pages with layers upon layers of intuitive imagery, created in a variety of mediums from gouache and acrylic painting, graphite drawings, and collage. I was fascinated by her journals, and her commitment to creating without expectation or knowing where it will end up. 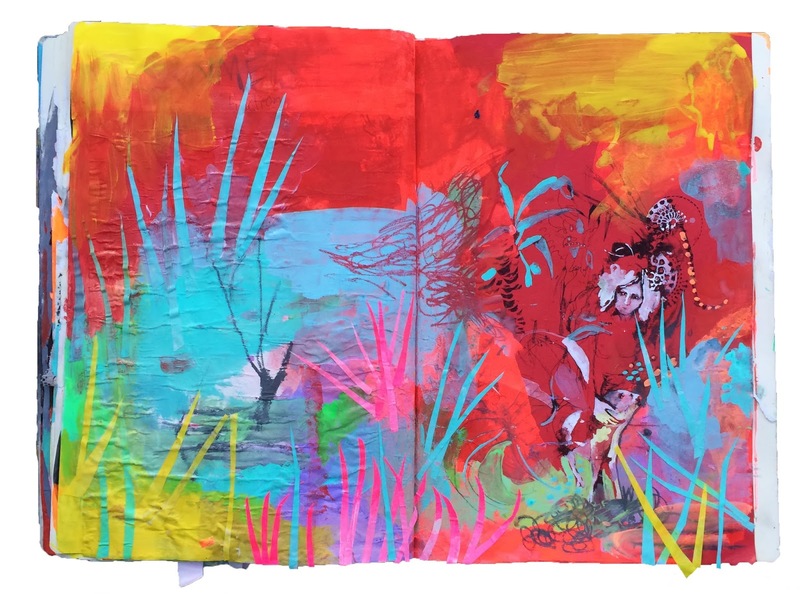 As a result, her work is dynamic and expressive, each page a work of art. Read on to learn more about Sherwood's work and influences. Journals, record-keeping, raw expression. I like to try to eliminate the space between thinking about something and making it. So, I am very influenced by stream-of-consciousness writing and drawing. Handwriting, mark making, colors, nature, paper, xeroxes, printmaking, reading books. And of course, artwork. I especially love the art of women around the Surrealist movement. Almost every day I think about how weird it is that I care about art so much. But the fact remains that I feel a strong and definite compulsion toward art making. I just have to trust that I am supposed to be doing it. There are other things I like to do (like running and playing music) that I enjoy but I don't have that same type of compulsion toward. I very much like the aimless and comfortable feeling I get when I am making work. When I don't make art I start to feel anxious. I have realized that just a few minutes of writing or drawing will snap me out of that anxiety. I just make lots of stuff by working into books and things, and other art will grow out of it--like paintings, comics, and collages. I simply make it and share it, and sometimes I hear that it resonates with people. I always feel curious to see what I will make next because I can't really tell what that will be until I do it. First and foremost, Leonora Carrington and Remedios Varo -- I'm obsessed with them, due to their practice of honoring the subconscious mind. But mostly I love a lot of work that I see being made nowadays. Artists that I see online: Alexandra Levasseur, Monica Canilao, Jiha Moon, Melissa Loop -- those are just some of them. I am attracted to looseness and tightness mixed together, to neutrals and neons, to interesting juxtapositions of colors and forms. I am amazed by abstraction. I like to practice abstraction but usually I feel like I must add something representational. Sherwood is the featured artist at Provenance Gallery in April and May. Join us for the closing reception on Second Saturday, May 14th. You can read more about her work, process, and inspiration on her website, www.cait-makes.com or follow her on instagram @cait_sherwood.